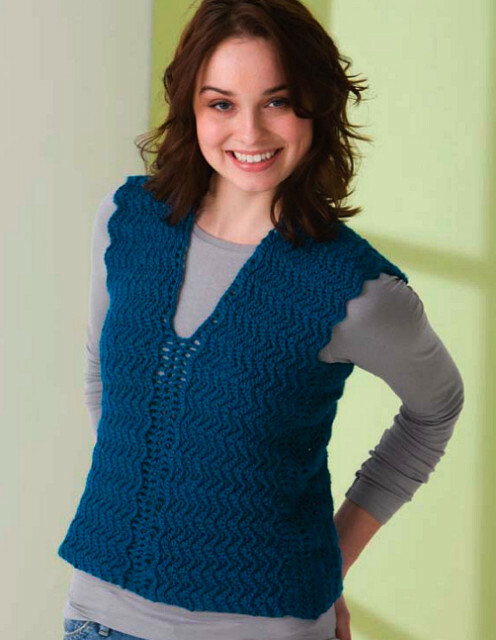 To make gauge swatch, ch 26, and work in ripple stitch pattern for 16 rows. Directions are given for size S, all other sizes are in ( ). Row 1: 2 sc in 2nd ch from hook, sc in each of next 2 chs, sc3tog, sc in each of next 2 chs, * 3 sc in next ch, sc in each of next 2 chs, sc3tog, sc in each of next 2 chs. Repeat from * across ending with 2 sc in last st, turn. Row 2: (work entire row in back loops only) Ch 1, 2 sc in first st, sc in each of next 2 sts, sc3tog, sc in each of next 2 sts, * 3 sc next st, sc in each of next 2 sts, sc3tog, sc in each of next 2 sts. Repeat from * across ending with 2 sc in last st, turn. Note: Pieces of garment are worked from side to side then assembled. Row 2: (RS) Ch 4 (counts as 1st dc + ch-1), dc in 3rd st, *ch 1, sk 1 st, dc in next st, repeat from * across, turn. Rows 3-4 (3-6, 3-8, 3-8): Ch 4 (counts as 1st dc + ch-1), dc in next dc, * ch 1, dc in next dc, repeat from * across working last dc into 3rd ch of tch, turn. Work Row 2 of the Ripple Stitch Pattern for 4.5” (4.5”, 5”, 5.25”) being sure to end on a WS row, turn. Next Row – edge neckline: (RS) Ch 4 (counts as 1st dc + ch-1), (working in back loops only) dc in 3rd st, *ch 1, sk 1 st, dc in next st, repeat from * across, turn. Next Row – create neckline: (WS) Ch 4 (counts as 1st dc + ch-1), dc in next dc, * ch 1, dc in next dc, repeat from * 44 more times, do not turn yet. Leave remaining sts of Row 22 unworked, ch 47, turn. For size XL only: Repeat Row 3 twice more. Next Row: Dc in 5th ch from hook (counts as dc + ch-1 + dc), * ch 1, sk 1 ch, dc in next ch, repeat from * across to the sts of Row 23, dc in first dc, ** ch 1, dc in next dc, repeat from ** across to end of row, turn. Repeat Row 5 (7, 9, 9), turn. Work Row 2 of the Ripple Stitch Pattern for 4.5” (4.5”, 5”, 5.25”) being sure to end on a RS row, turn. Next Row – shape armhole: Ch 4 (counts as 1st dc + ch-1), (working in back loops only) dc in 3rd st, *ch 1, sk 1 st, dc in next st, repeat from * 39 more times, leaving remaining sts unworked, turn. Next 2 (4, 6, 6) Rows: Ch 4 (counts as 1st dc + ch-1), dc in next dc, * ch 1, dc in next dc, repeat from * across working last dc into 3rd ch of tch, turn. Next Row: Ch 1, sc in each st and ea ch-1 sp across, fasten off. Row 2: Ch 4 (counts as 1st dc + ch-1), dc in 3rd st, *ch 1, sk 1 st, dc in next st, repeat from * across, turn. Work Row 2 of the Ripple Stitch Pattern for 14” (15”, 16”, 17”) being sure to end on a RS row, turn. Next Row: Ch 4 (counts as 1st dc + ch-1), (working in back loops only) dc in 3rd st, *ch 1, sk 1 st, dc in next st, repeat from * 39 more times, turn. With RS facing each other whipstitch shoulders & sides. Weave in all ends. The Crochet Dude® is a registered trademark of Drew Emborsky, all rights reserved. Photo copyright SCG, used with permission. Do no copy or distribute this pattern – but please share the link with all your friends! Click the green Print Friendly button to print or save as a PDF for your own personal use. Add this to your Ravelry queue!